Last year when Conan O'Brien was unceremoniously bumped from the Tonight Show when Jay Leno failed in his 10 pm slot, he was given severance cash and and had to agree not to apprear on TV or Internet web shows for 6 months. For the Harvard educated comedian the offspring of a lawyer and a doctor it was a hard hand to play. His team decided to take it on the road aptly named “Legally Prohibited From Being Funny On Television Tour to 32 cities across the country. Television director Rodman Flender follows Team Coco as they conceptualize the road show. O'Brien is sharp, witty and hyperactive. The vanity project is filled with comedy bits, music, and layered with a sharp bitterness that lingers throughout the film. The fast selling online ticket sales puts on the pressure to brainstorm material. The snappy improvisations are fast and clever during marathon writing sessions, band rehearsal and auditioning back up singers who will be called the Coquettes. He changes the words to the Willie Nelson song “On The Road Again” to “I Want My Show Again”. 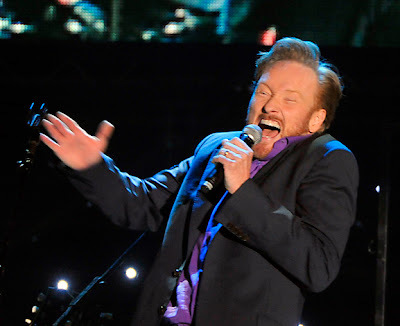 Most of what is shown of his routines are the musical portions with Conan on guitar and singing. He's a fairly competent musician but what he lacks in vocal skills he makes up in confidence. For one number, “Polk Street Annie” he dresses in a skin tight paisley leather outfit like Eddie Murphy in Raw while dancing around with his singers. Various star pals show up in different cities to help out like Jim Carrey, Stephen Colbert, Jon Steward, and Eddy Vedder. Jack McBrayer of 30 Rock hangs out back stage to endure verbal barbs by Conan. Conan is also short tempered in a way that still takes the sting out of his comments. He is relentless with his assistant Sona Movsesian who he fires for bringing him fish cooked in butter in stead of without. She dryly responds by promising to take care of it and that getting fired is a common occurrence. She coaches him on putting on his show makeup like a nagging friend, he acquiesces with good nature until later on the tour he's bickering with her about it. The film is peppered with little moments with Conan's manic energy. One wonders if he ever slows down. After the shows he does meet and greets with his fans, and families of his singers. He smiles, and chats with everyone with a playful banter, then when they leave he complains about having to talk to people he doesn't know. His Late Night with Conan show was uneven, silly and sometimes down right brilliant. That's to be expected in a show that you have to maintain day in and day out for the past 22 years. You would think that he would be happy to just kick back and enjoy the huge payout. But as most artists, if don't use your talents you lose it. The documentary makes one wish they had gone to one of the shows. The tour ended just as he was set to begin is new show now airing on TBS.